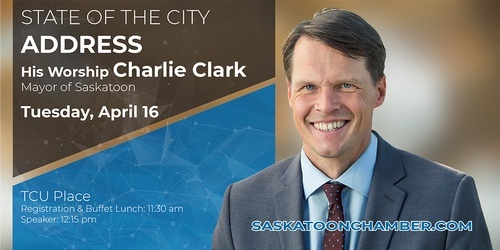 Charlie Clark was elected Mayor of Saskatoon in October 2016. Previous to that, he was Ward 6 City Councillor for 10 years. His professional background is in the areas of mediation, education and community economic development. Mayor Clark has been part of nation-wide conversations about the key role cities play as engines of innovation and in ensuring quality of life for all citizens. He has presented nationally at conferences on affordable housing, urban development, policing and community safety issues. He is committed to working with the talent and resilience of Saskatoon people to be the city that gets it right. He is married to Sarah Buhler, a law professor at the University of Saskatchewan, and they have three children: Simon, Ben and Rachel. Cancellations are accepted until 3 days prior to the event. Contact (306) 244-2151 or chamber@saskatoonchamber.com. If you are unable to attend after the cancellation deadline, registration can be transferred to another person.